Pull up a chair and get moving with this low impact workout focused on muscle strengthening, aerobic conditioning and stretching to improve your overall health and mobility. These group exercise classes are performed at various community centers surrounding our clinic locations. 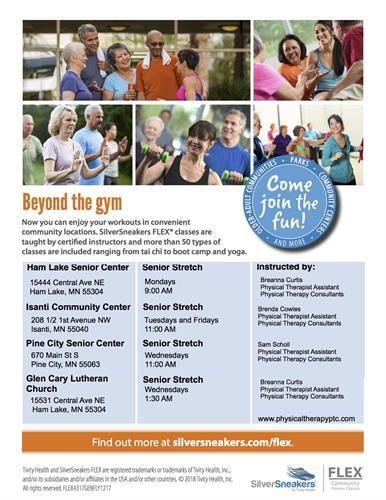 The classes meet 1-2 times per week and are free for seniors to attend. We are also proud to offer Silver Sneakers FLEX® classes. Tivity Health, SilverSneakers and SilverSneakers FLEX are registered trademarks or trademarks of Tivity Health, Inc. and/or its subsidiaries and/or a liates in the USA and/or other countries. © 2017 Tivity Health, Inc. All rights reserved.